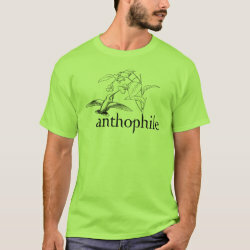 An anthophile is one that loves flowers, one that is attracted to flowers, or one that feeds on flowers. That sounds like a perfect description More... of our little winged jewels, hummingbirds. This simple black and white line drawing depicts a hummingbird feeding on a blossom, with the moniker anthophile written underneath.